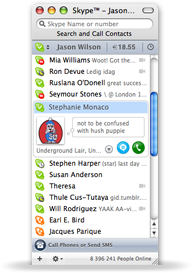 Sykpe team released a new beta version of their famous VoIP client for Mac OS X.
Leopard compatible – if you have the latest Mac OS X 10.5 then you can use Skype with confidence. Better video resolution – your video conversations are now set at a whopping 640 x 480 pixels by default with up to 25 frames per second. If your webcam can handle this resolution you’ll soon be appearing in an improved and bigger format on friends screens.